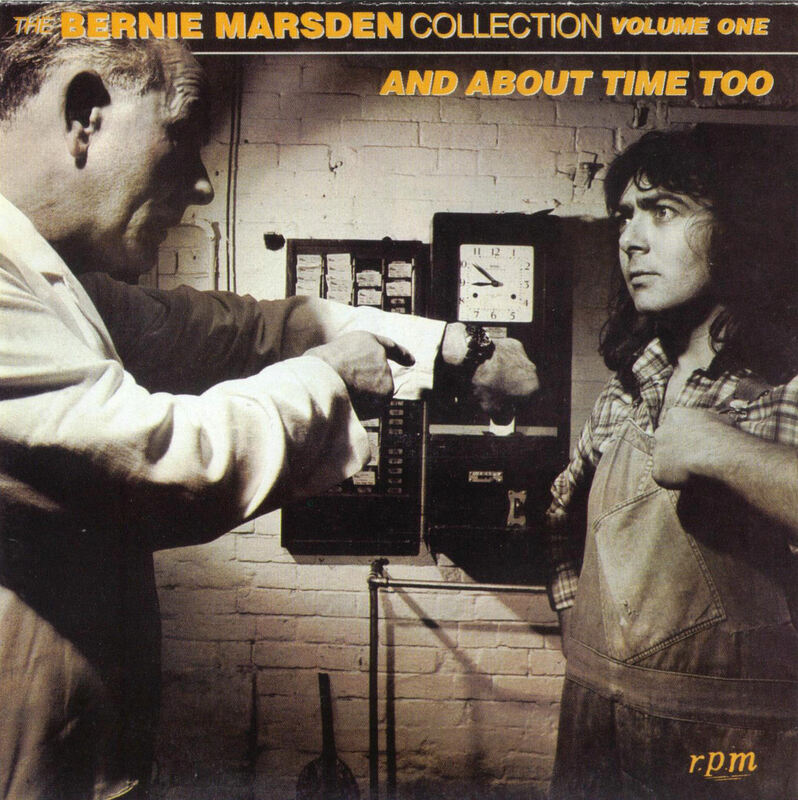 A long overdue and very welcome reissue (by me, anyway) for the two solo albums released by Bernie Marsden back in the days when he was guitaring with Whitesnake. Both of these have appeared on CD before, via Purple Records, but they’ve been out of print for a fair wee while now. With Whitesnake being so popular in Japan, it was a Japanese record deal that saw Marsden using some Snake down time in July 1979 to record his solo debut. And he certainly got an all star line up together to make it. Jack Bruce appeared, courtesy of his former boss, Cozy Powell, as he’d played on Cozy’s album “Over The Top”. The other musicians are Don Airey (Rainbow, Ozzy, Deep Purple, Colosseum II) on keyboards, Ian Paice (Whitesnake, Deep Purple) on drums, drummer Simon Phillips (Jeff Beck, David Gilmour, Judas Priest, Toto), Cozy Powell (Jeff Beck, Rainbow, MSG, Black Sabbath, Whitesnake) on drums, Neil Murray (Colosseum II, Whitesnake) on bass and Jon Lord (Deep Purple, Whitesnake) on keyboards. It’s very much an album of its time, and jumps all over the place stylistically. There are pop songs that would have sold well, if they’d been sold to a top female singer of the time (‘Love Made A Fool Of Me’), some heavy blues (‘Brief Encounter’) and the usual sprinklings of jazzy guitars and late seventies synths. If it wasn’t chock full of my favourite musicians, it would be filed away as a curio. It sounds good, with a production from Martin Birch, and comes with a bonus track in the shape of non-album b-side ‘You & Me’. Oddly, although that appeared on the Purple reissue, neither of the live tunes that were added to that – ‘Who’s Fooling Who’ and ‘Shakey Ground’ – appear here. Two years later, and it was time for a follow-up. Marsden roped in his Whitesnake colleagues again, so it’s a band largely comprised of Ian Paice, Neil Murray and Jon Lord, although Simon Phillips appears as well. And let’s not forget the invaluable contribution of Micheal Schenker who appears on one song performing hand-claps! It’s a stronger release, as it’s more focussed on mainstream rock than its predecessor, with only his Temptations cover, ‘Shakey Ground’ straying into poppier territory. Again, it’s mainly for completists, but I have played this one much more over the years, so it’s probably the best one to start with. Again, it comes with a non-album b-side ‘Always Love You So’, and again, it loses the live tracks from the Purple Records CD version – ‘Look At Me Now’ and ‘Byblos Shack’. Both have sleeve notes based on a new interview with Bernie conducted in 2012 specifically for these releases. I’m a fan, so I’m pleased to see them, and for fans of seventies rock, the all star guest list makes them both worth investigating. Thanks Stuart. These were first issued on CD when I did them on RPM Records. Purple Records later reissued them but only had the license for a few years. At the end of that period as sales had tailed off it was not really economic to renew, as it costs quite a bit. The bonus tracks were from a BBC session. Another superb review by Stuart A Hamilton. Certainly I will order these. Some time ago I bought the Marsden anthology and I was amazed to see the prices online these days!! Not that I would sell – but for keen fans it’s a 2cd set well worth finding if you can. Have both of those on vinyl. Just wondering who the guy is opposite Bernie on And About Time Too? His name is Mr. Allen, he was a a character model. He was the brother of Allen from the music-hall duo Flanagan and Allen, and apparently kept Bernie amused during the cover shoot with tales of his brother’s show-biz antics!